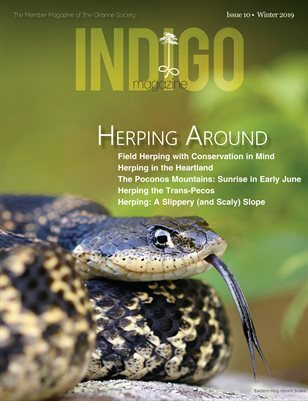 This article is from the perspective of both a staff member, Houston Chandler, and an attendee of Indigo Days, Michael G. Starkey, the Co-Founder and Executive Director of Save the Snakes. This year’s December Indigo Days event began like most others, with members gathering on the Orianne Indigo Snake Preserve early on a chilly winter morning. This event had a large turnout of over 40 members, traveling from as far away as New York to help us survey for Eastern Indigo Snakes (Drymarchon couperi). The diverse group included hobbyists, field herpers, wildlife enthusiasts, photographers, biologists from Georgia DNR and US FWS, and members of other nonprofits. All with an interest in reptile and amphibian conservation. Collecting data on an Eastern Indigo Snake. Overall, Indigo Days was incredibly successful. All members got the chance to see at least one Indigo Snake, including one large male that we had been trying to catch since the beginning of the survey season. We showed everyone how we handle, process, mark, and swab snakes for Snake Fungal Disease. One group got to observe an Indigo Snake in a Gopher Tortoise burrow via a burrow camera (which is actually harder to see than one on the surface). Several Eastern Diamond-backed Rattlesnakes (Crotalus adamanteus) were seen hanging out in Gopher Tortoise burrows, apparently unconvinced that it was warm enough to come all the way out onto the surface. On Sunday, longtime Orianne member Noah Fields caught a juvenile Pine Snake (Pituophis melanoleucus) as it tried to crawl down a rodent burrow. That may have been the highlight of the weekend for many! Walking through one of the few remaining stands of Longleaf Pine looking for one of the most impressive animals in the United States makes for an enjoyable weekend in early winter. It is always rewarding introducing people to these magnificent animals and encouraging them to support the conservation of imperiled reptiles and amphibians. On a clear, crisp December weekend, about 50 individuals gathered in a rural part of southern Georgia. Armed with snake hooks, snake boots and serious determination, this group was organized for one purpose: To find snakes. Not just any snake though, for this particular weekend was Indigo Days! Organized and hosted by the Orianne Society, this annual event is held in appreciation of their members and invites them to participate in their indigo snake surveys. Indigo Days is a fantastic opportunity for individuals interested in snake conservation and ecology to observe eastern indigo snakes in their natural habitat. Eastern Indigo Snake found in a Gopher Tortoise Burrow. Photo: M. Starkey. First of all, what makes indigo snakes so special? The Eastern Indigo Snake is a large, black, non-venomous species of snake that lives in the southeastern United States. This species can reach almost nine feet in length, making it the largest snake species in the United States. This species has a huge home range and requires large expanses of habitat. Pound-for-pound they need as much territory as a lion and male snakes can patrol more than 1,200 acres! It’s a stunningly beautiful animal, but like many other wildlife species, it is endangered. Habitat loss and fragmentation are the most significant causes of the indigo snake’s decline. As a result, the species was listed as a Threatened Species in 1978 on the Endangered Species Act of 1973. Yet, their population is still in decline. Fortunately, the Orianne Society is dedicated to protecting this vulnerable species and its habitat. The mission of the Orianne Society is to conserve critical ecosystems for imperiled reptiles and amphibians using science, applied conservation and education. As one of the greatest threats to indigo snakes is habitat destruction, the Orianne Society created the Orianne Indigo Snake Preserve in South Georgia, which protects areas of important Eastern Indigo Snake habitat. They are also actively working with private landowners to expand the area of protected habitat. The indigo snakes act as a “flagship species”, because when you protect the habitat of the snake, many other species benefit. Gopher Tortoises, Eastern Diamondback Rattlesnakes and countless bird and mammal species call this part of Georgia home. On Indigo Days, you have the opportunity visit the Preserve and learn how the Orianne Society studies and protects the indigo snake. This event is a two-day event and it is always in the fall-winter period, so that it corresponds with the Orianne Society’s indigo field season. Young Florida Pine Snake; another Longleaf sandhill associated species. Photo: M. Starkey. For this past Indigo Days, our group met at the Orianne Society’s Indigo Snake Preserve and we separated into three parties to survey different properties. After a quick review of safety procedures and protocol, we went out looking for indigos! The ideal habitat to find indigo snakes is Longleaf Pine forest, with an abundance of Gopher Tortoise burrows. The snakes use the sandy burrows to escape the cold, but they will bask at the burrow entrance on warm winter days. Our group spread out, trekked through the forest and surveyed each Gopher Tortoise burrow that we could find. A few of the participants were lucky enough to spot an indigo snake basking near the burrow. When a snake was captured, the Orianne Society team processed the snakes. They gathered morphometric data, sampled for disease and checked to see if the snake had been captured before. Because the Eastern Indigo Snake is a protected species, the Orianne Society has the proper permits to conduct their research. After a brief photo session, the snakes were released back where they were found. However, as only a few snakes were seen on the surface, the Orianne Society team was interested to observe a snake inside one of the burrows. In order to survey inside the burrow, they used a long scope attached to a video monitor. It was quite interesting to see the video feed as the scope picked up what was inside the burrow. The best part? We found an indigo! The Orianne Society explained to our group just how critically important Gopher Tortoises are for Eastern Indigo Snake conservation. Without the burrows, the snakes have a difficult time finding refuge in the winter. Over 400 species of wildlife have been documented to use Gopher Tortoise burrows! While Indigo Days is mostly about celebrating the indigo snake, it was clearly much more than that. Our group was delighted to learn about the Longleaf Pine ecosystem, the countless other wildlife species that thrive in it, and what we can do to protect this national treasure of the southeastern United States. To observe an Eastern Indigo Snake in the wild is a truly remarkable experience. So, if you are interested in seeing an indigo snake for yourself, join the Orianne Society! By becoming a member of their organization, you support their critically needed indigo snake conservation efforts and you can join us next year for Indigo Days! Cover photo by M. Starkey.